Welcome to my review of the Swiftech MCR220QP, this happens to be a radiator I traded another forum member for and used it as my third chipset loop. Just like it's bigger brother the MCR320, the 220 exhibits the same slim style radiator optimized for low speed fans targeted at the mainstream market segment where users want high performance without breaking the bank. With this review I plan to cover radiator characteristics, hydraulic restriction, and thermal performance with a wide range of fans. I'll follow my typical engineering/technical flavor and keep the commentary to the point. 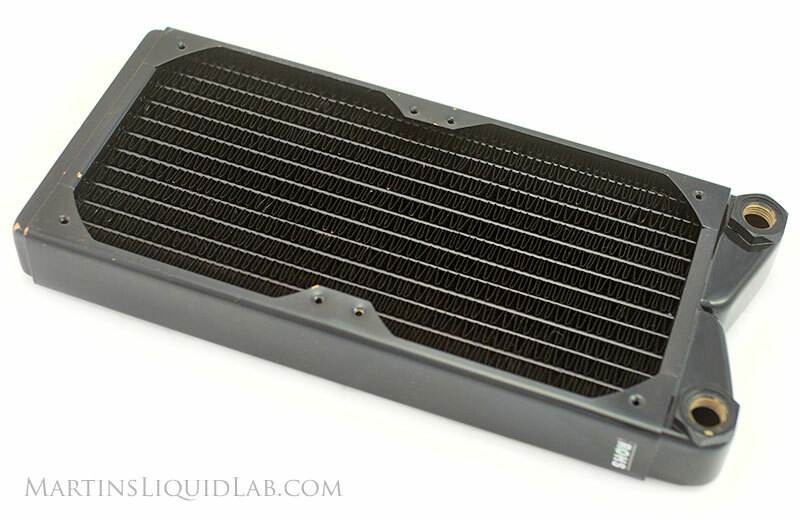 In the end, I hope to provide you with some tools to help you design your water cooling system with this radiator. 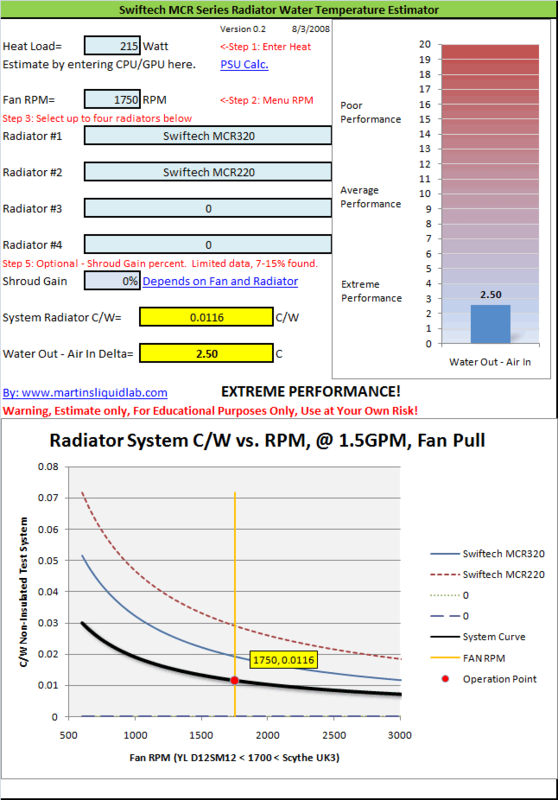 My ultimate goal is to help you better understand how heat load and fan selection affects the performance of this radiator as well as hydraulic restriction. Here is my lightly used MCR220 that was tested, it does exhibit some chipped paint that occurred in both of my radiators. Paint quality is lacking and easily chipped. Some of the premium radiators like the TFC and HWlabs radiators are much better with paint quality and finish. I measure approximately 14.1 folds per inch average, (Frontal length is 9.25" with 130 folds). The fins are a good open density, although the consistency in spacing is poor. Some areas are more dense than others as you can see in the above photo which is worse than your typical premium style radiator. I don't think this hurts performance much at all, but it doesn't portray much attention to detail that you would recieve in more premium priced radiators. Here is the raw data collected. And here it is compared to a few other sources and one other double radiator I tested, the XSPC. I also measure less restriction that was published on Swiftech's site, but reasonably close. I used a more standard high flow D-Tek barb in this testing. 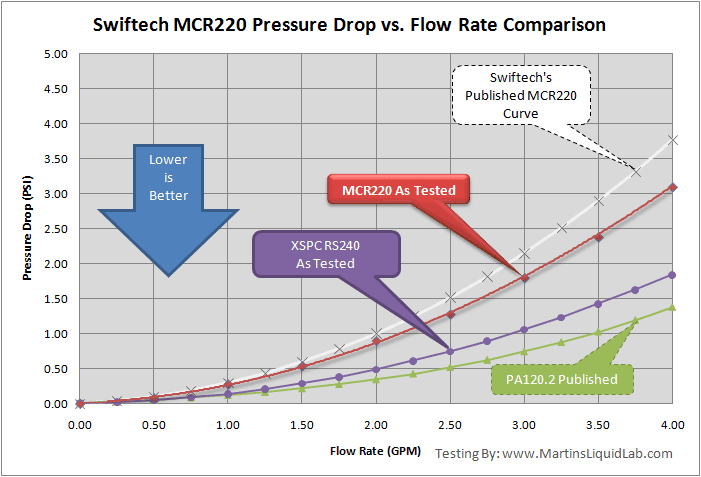 Overall I would consider the MCR220 is still reasonably low in restriction compared to CPU blocks that can easily be double this amount of restriction or more, but it's not as low in restriction as the XSPC RS240 that I previously tested or as low in restriction as the premium double thickness radiators like the PA120.2. If you're considering multiple radiators, the MCR220 is almost twice as restrictive as the XSPC RS240 and about 2.4X as restrictive as a PA120.2. I followed the same testing specs as outlined here, except I elected to only test at the 300 watt level heat load. Overall the thermal results are very good and better than expected, the larger frontal surface area (extra width beyond 120mm) is beneficial to good heat dissipation and optimizations with low-medium speed fans. Overall from the ulra low speed to ultra high speed fans exhibits a 2.6X performance change, so fan selection is still critically important to the overall performance as it is with most radiators. If you planned to use ultra slow speed fans at 1000RPM you will only dissipate roughly 210 watts at an average 10C delta vs 529 watts using the 3000RPM 38mm fans. There also appears to be a relatively linear trend between heat dissipated in watts vs RPM. Just to run through some options/design. A single overclocked dual core processor can dissipate around 125 watts of heat between cpu and pump, so in that case an MCR220 would be capable of delivering a high performance 5C delta with fans at only 1200RPM, this would be a nice silent setup. However on a quad core, you would need more substantial fans for that level of performance where you would need something in the 2000RPM range. For a CPU/GPU combo, you'll likely only manage 10C or what I'm calling average water cooling performances. These aren't bad, they just are not extreme. For something like 300W setup with a dual core and 8800GTX card, you could get average performance with about 1500RPM. If the above charts are confusing, no worries, I've figured out a way to take that data and create another calculator for you. 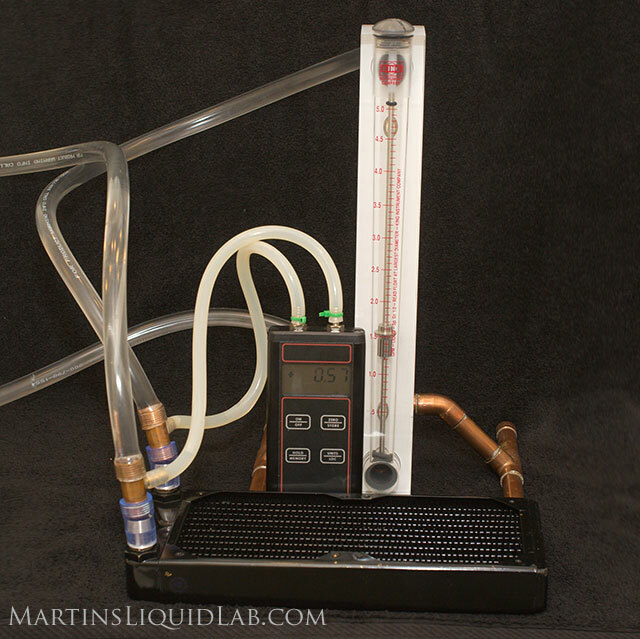 This estimator provides you a means to estimate your water delta based on your actual heat load, fan RPM, and even provides a shroud boost option. Furthermore it allows you to estimate the heat using more than one radiator and mixes of sizes that I've tested. 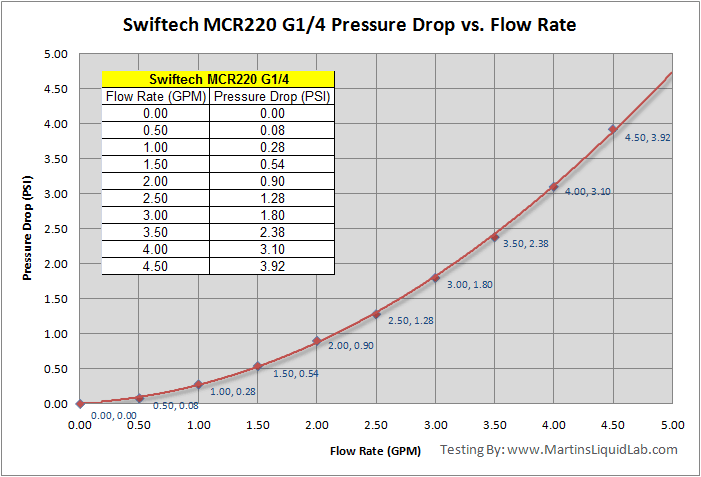 So far, I have only included my tested MCR220 and MCR320 results. Good value, high performance/low cost! The MCR220 is really a good all around performer at a great price. 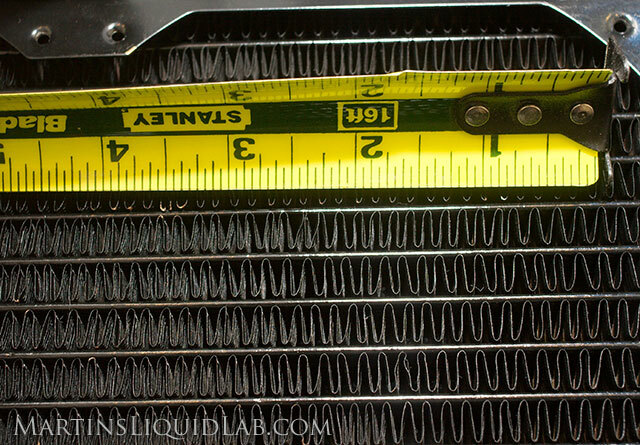 It does exhibit a few quality issues like the poor paint bonding and irregular fin spacing/density, but for those willing to overlook these things and get really great thermal performance at low prices, this radiator is an excellent option.